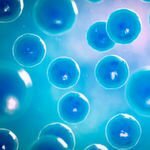 [/b]The Standardization Group for Embedded Technologies (SGET) has officially announced the ratification of the new SMARC(TM) Computer-on-Modules specification. Kontron played the leading role in the development of the specification which had the working title ULP-COM. This new Smart Mobility ARChitecture for ARM/SoC-based extremely compressed Computer-on-Modules was approved within a short time frame. The speedy ratification goes to underline the market's need for a new ARM/SoC based form factor standard, as well as, the agility of the newly created SGET body. Coinciding with the adoption of this new standard, three design lines have already become available at Kontron. Developers can now begin engineering innovative ultra-low-power devices based on the new SMARC(TM) standard. "It is thanks to the quick and efficient work of the SGET and its members that the manufacturer-independent specification of the new SMARC(TM) standard, initiated by Kontron, was completed in 2012. The SGET passed its debut with flying colors and demonstrated how efficiently it worked. Eliminating the standardization bottleneck, the embedded market can now benefit from having an additional standards body contributing to innovative specifications and bringing new standards to the market within just a few months time," explained Peter Müller, Global Product Line Manager for Modules at Kontron, and continued, "The SMARC(TM) specification, as a standard for ARM/SoC-based building blocks in miniature format, has filled a very significant gap in the embedded market. Hats off and many thanks to all the members of the first SGET standardization team who worked extremely efficiently on this new standard." The ratification of the SMARC(TM) standard underlines Kontron's power to innovate in its role as an international technology leader and as a 'standardizer' of Computer-on-Modules. With over 15 years of experience in the development of COMs, Kontron provides extensive support along with notably long-term product availability. Industrial customers, partners and module manufacturers profit from the high level of investment security which Kontron offers. 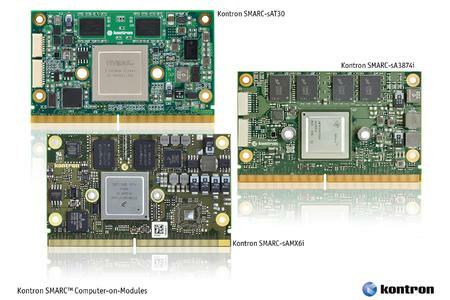 Kontron's success story began in 1998 with Dimm-PC® which, in 2000, lead to the ETX® standard being licensed worldwide. The x-board® specification followed in 2002 and COM Express® technology was launched in 2004. Over the years COM Express® has been consequently adapted to meet the increasing need for miniaturization on a high performance level: in 2006 COM Express® basic was succeeded by the smaller COM Express® compact and in 2008, COM Express® mini in the credit card format was introduced. SMARC(TM) is the latest result of the consequential further development of Computer-on-Modules standards for energy-saving ARM/SoC processors - and an innovation boost for the ultra-low power embedded market. SMARC(TM) is the brand name of the first form factor specification of the SGET. The SMARC(TM) specification describes extremely flat ARM/SoC-based ultra-low-power Computer-on-Modules in miniature format. The module specification is aimed at manufacturers of Computer-on-Modules as well as carrier board and system developers. OEMs and VARs profit from the new specification due to the resulting comprehensive ecosystem for ultra-flat ARM/SoC-based Computer-on-Modules in miniature format. The specification is available free of charge on the SGET website. The application areas for the new SMARC(TM) modules range from solutions in the automation market up to graphics and image-centric devices which also require extremely low energy consumption and have to withstand extreme environmental conditions. The new modules serve as a building block solution for very small portable handheld devices as well as for all larger devices in which consumption must not exceed a few watts and the computing power has to be particularly high. Moreover, it is expected that the performance will further increase with future technical progress. Kontron has already launched three highly scalable SMARC(TM) module families with ARM SoC processors such as Freescale(TM) i.MX 6, Texas Instruments Sitara 3874, and Nvidia® Tegra(TM) 3. In accordance with the ratified specification, the names of these ultra-low-power Computer-on-Modules (ULP COM) have been changed to SMARC(TM) . - The Kontron ULP COM-sAMX6i supporting the extended temperature range by-design with single, dual and quad-core ARM® Cortex A9 technology on the basis of the Freescale i.MX 6 series is now SMARC(TM) -sAMX6i. - The Kontron ULP COM-sA3874i with the extremely power efficient single-core Texas Instruments Sitara(TM) 3874 microprocessor (MPUs) also for the extended temperature range with 800 MHz Cortex(TM) A8 technology is now SMARC(TM) -sA3874i. - The Kontron ULP COM-sAT30 with the 1.2 GHz NVIDIA® Tegra® 3 quad-core ARM processor (Cortex A9) and high-end graphics support is now SMARC(TM) -sAT30. 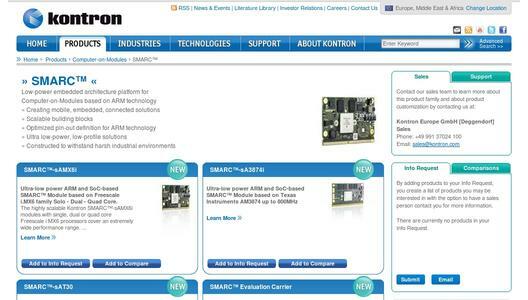 Find out more about the modules by visiting the Kontron SMARC(TM) website. The SMARC(TM) specification is expected to become available in the SGET Download Area soon.